U.S. military guards move a detainee inside the detention center at Guantanamo Bay, Cuba. President Barack Obama's efforts to close the U.S. prison at Guantanamo Bay, Cuba, are expected to face some crucial Senate votes this week, and for the first time in four years, he stands a chance to win some. A Senate bill to authorize defense spending contains some of the loosest restrictions yet on transferring Guantanamo prisoners, including possibly to the United States for detention, trial or medical care. The bill would still require certification from the secretary of defense that the 164 Guantanamo prisoners won't pose a danger if transferred to the United States or other countries. But the streamlined process could help the Obama administration make progress on a goal that appeared all but given up for lost. This year, the administration is using tight budgets as part of the argument for closing the prison that Obama, in a speech at the National Defense University in May, said was a symbol of the U.S. flouting the law that "should never have been opened." Defense Secretary Chuck Hagel, in a letter to Rep. Adam Smith, top Democrat on the House Armed Services Committee, has put the tab on holding Guantanamo prisoners at $2.7 million this year per detainee, compared with $34,046 to hold a detainee at a federal maximum-security prison. At a time when the Pentagon is fighting to stop budget cuts known as sequestration, Guantanamo funding is an issue. Senate Republicans, led by Sens. Kelly Ayotte of New Hampshire and James Inhofe of Oklahoma, have proposed tighter restrictions that are expected to be voted on this week. A Senate aide says the votes are expected to be close. House lawmakers have already passed a bill that continues tight restrictions, including a ban on transfers of prisoners to Yemen. Obama has lifted his ban on Yemen transfers, and the administration has restarted efforts with the Yemeni government to establish a facility to hold transferred prisoners. The Yemen efforts were halted after the 2009 Christmas Day underwear bombing attempt, which was plotted by the Yemeni al Qaeda affiliate. Still, proponents of closing Guantanamo believe they have the best chance in four years to make progress on their goal. Obama himself is engaged, officials say, and Lisa Monaco, the president's homeland security and counterterrorism assistant, has been meeting with senators to push on the issue. For the first time in the Obama administration, the Defense Department now has a high-ranking official responsible for the closure efforts. Chris Anders, who lobbies on the issue for the American Civil Liberties Union, says after many losing votes on Guantanamo, the upcoming votes are expected to be close, but the president stands a chance. "These are winnable votes. It's been a very long time in the Senate on Guantanamo issues that there are winnable votes." Obama has been on a losing streak on Guantanamo almost from his second day in office, the day he sat before cameras and signed the order to close the prison. His goal was to close it within a year. But the administration had done none of the political work needed to make that happen, and in May 2009, the Democratic-controlled Senate voted 97-6 to strip funding aimed at closing the prison. Despite restrictions, the administration managed to move dozens of prisoners to their home countries or other countries that agreed to accept them. Still, the Obama White House moved the issue to the back burner as aides decided it was best to focus on health care and other priorities. It was no surprise, then, that in the last three years, by the time the Senate defense authorization bill emerged, it contained strict restrictions on prisoner transfers. This year is the first with loosened restrictions. Ayotte, at a Homeland Security and Government Affairs Committee hearing last week, tried to enlist the support of Federal Bureau of Investigation Director James Comey for keeping Guantanamo open. She got him to agree the FBI prefers longer periods for interrogation, but he steered clear of declaring a preference on Guantanamo. She made reference to the recent capture of Abu Anas al Libi, wanted in the 1998 embassy bombings in east Africa and who was interrogated for a week aboard a Navy ship before being brought to New York for trial. "Right now, the administration has chosen not to use Guantanamo," she said. "The administration is putting people on ships. But al Libi - to only interrogate someone like that for seven days - it seems to me that we're losing opportunities to gather intelligence." Sen. Carl Levin, chairman of the Senate Armed Services Committee, where the defense authorization bill is assembled, pushed back on Ayotte. Comey, a former federal prosecutor and deputy attorney general who has tried terrorism cases, said the federal courts have a proven track record of handling terrorist trials. Levin, D-Michigan, asked Comey, "Now, the argument's been made that this - bringing terrorists to trial, either directly for trial in the United States or from Guantanamo - somehow or other creates a security threat for those communities in which they're held. Do we have any evidence to support that kind of a conclusion?" Comey responded, "I don't know of any, senator, with respect to a threat created in the area of a prison facility." In a statement Monday evening the Office of Management and Budget said the committee’s provisions are a significant improvement over existing law. 15 percent can never be released, 20 percent need to sent to third countries the rest can be returned to their countries of origin. The 20 percent the US will see coming the other way, a percentage of the rest would be a danger to their country of origin a localized threat not a US threat. Now who is held and who is released is up to the country of origin once they are returned. The 15 percent are death penalty and lifers. The 20 percent have to be isolated, compartmentalized in third party countries. Forget about al-Qaida the rules are if anyone person commands 300 or more armed combatants be them smurfs or anyone else that is or was grounds to be detained in Gitmo. The 20 percent being compartmentalized and isolated in third party countries should be able to monitored and when there is enough evidence they are going to be coming the other way arrested, tried and jailed under common law. I would not expect them to go quietly however. Maybe they blow themselves up, die in accidents, robberies, disappear, medical ailments, suicides, the rest of the 20 percent would behave themselves. Gitmo was about deterrence, scare the cleanskins homegrown, it worked. That was what really had people concerned a demographic that was impossible to monitor, anglo's. Like it not the other demographics are racially profiled. There was an uptick in cleanskin and homegrown attacks on the US small but an uptick once Gitmo was no longer being used as was the case with the blacksite prisons. That shrinks the demographic because it only leaves the hardcases to deal with, the ones that understand it is not some sort of game. This is another difficult story over at CNN.com. How should we deal with Guantanamo? How should we deal with the prisoners? They were military combatants. Do we want them in our prisons recruiting American criminals for a holy war? I think that after these men had to endure so much torture while in this obscene captivity Wayne, I say turn them loose! I guess that we don't have the moral courage to do that, unfortunately. I did not know Obama was having them tortured? Gitmo just happens to be another promise that this clown Obama made in his 2008 presidential campaign only to break it after becoming President! I say that since those men had to endure so much torture while they were there, I say, turn them loose here and now! Hey while we are at it lets release Charles Manson too. He has been an awful good boy these past few years. "...he bill would still require certification from the secretary of defense that the 164 Guantanamo prisoners won't pose a danger if transferred to the United States or other countries." ALERT: John Kerry is not qualified to certify anything. Do not bring this trash onto American soil for any reason. Ha....Most of the dudes in our "super max" prisons make these GITMO terrorists look like saints. Quite true Portland, quite true indeed! In fact at least 85 or more % of the Gitmo detainees just happened to be in the wrong place at the wrong time. They were being held in large part just to make our military look good in this so-called "war on terrorism". On the other hand, most of the criminals being held at our "super max" prisons are self serving career criminals. 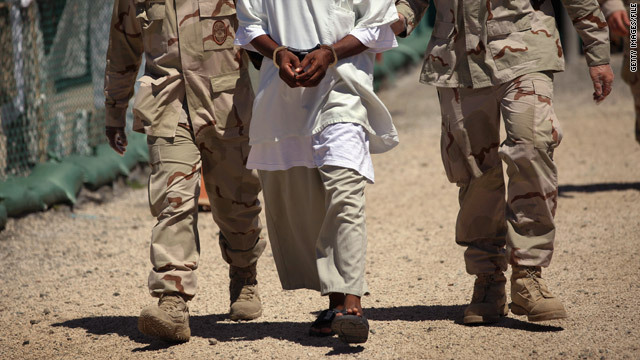 GITMO has become the US's Devils Island, but only worse. Alleged bad guys are being held without trial indefinitely, whereas the French at least held a trial before their incarceration.The horrors of this penal settlement "Devils Island" were publicized during the Dreyfus affair, as the French army captain Alfred Dreyfus was unjustly convicted of treason and sent to Devil's Island on 5 January 1895. Why in this day and Age of Enlightenment does the US hold so-called anti-American terrorists with out regard to the precepts of international law? Either bring them to trial, exonerate or convict them or exile them as former prisoners of war. Holding them indefinitely is a farce....there are a lot more folks out there that are far more dangerous and running free doing "evil" deeds to US interests throughout the world, yet we can't find the political will to get on with it and close the GITMO POW camp of wars now over. Sad! Captives on Devil`s Island were not enemy hostiles of the state who attacked France – GITMO is for military combatants, not civil criminals. There is no analogy here.